Discover what to do in the Barranco Oscuro Natural Reserve in Moya, Gran Canaria. The Barranco Oscuro Natural Reserve is located between the municipalities of Moya and Valleseco, on the north of Gran Canaria island. 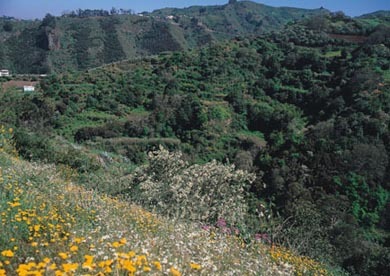 The Barranco Oscuro Natural Reserve has an extension of approximately 35 hectares. This precious ravine stretches until la Virgen and has some of the best samples of laurel in Gran Canaria. In Barranco Oscuro you might find all types of bushes such as the Sidesritis discolor, Gesnouinia Arbera and the almost missing Isoplexis chalcantha. In this brown woods there’s also a great variety of fauna like hawks, owls, bats and many different species of invertebrates. The Barranco Oscuro Natural Reserve is included in the Doramas Rural Park. Between the municipalities of Moya and Valleseco, Gran Canaria.